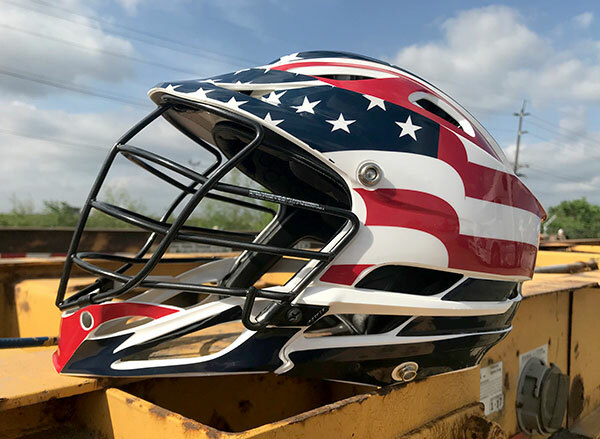 The Lacrosse Outreach Foundation (LOF) men’s lacrosse program of Colorado is gearing up for an overseas trip to play in Japan this upcoming June. They will not only have the opportunity to play against local men’s teams, they will also sight see in several cities and experience local culture, customs, cuisine, and nightlife. This is the sixth trip LOF has taken in as many years. Past trips have included traveling to Europe, Australia, and Costa Rica. This year’s 2-week trip and is sure to be an unforgettable experience. 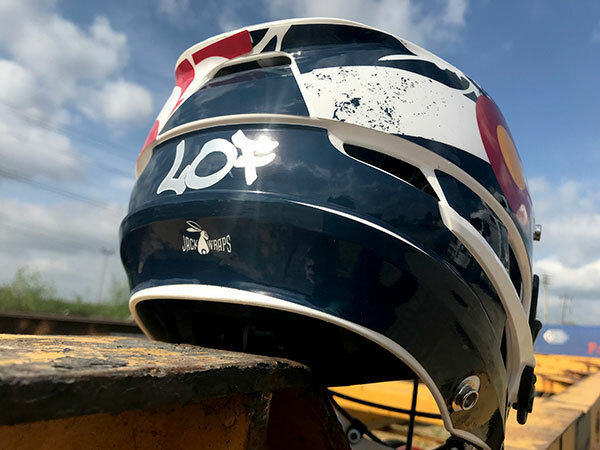 Recently LOF approached us to design custom lacrosse helmet wraps to wear on their upcoming trip abroad. During our initial discussions it was clear they wanted their design to honor both the United States and their home state of Colorado. Based on that, it was quickly decided in the concept phase to split the helmet wrap design in half with each theme taking a side. An oversized American flag image dominates one side of the design. A waving flag image was illustrated from front to back, adding movement to the design. 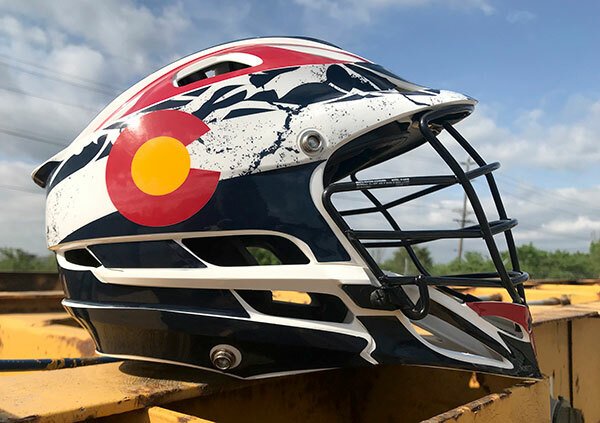 The reverse side of the helmet features the State flag of Colorado. This flag is also oversized and includes an abstract mountain range in the background of the flag. The mountain range was a request that proved to be tricky to incorporate into the design. By making it abstract, it acts as almost a background pattern and does not distract from the main Colorado logo. Grunge elements were included as well to give this side of the helmet a grittier feel. The state logo cleanly stands out against the gritty mountain backdrop. 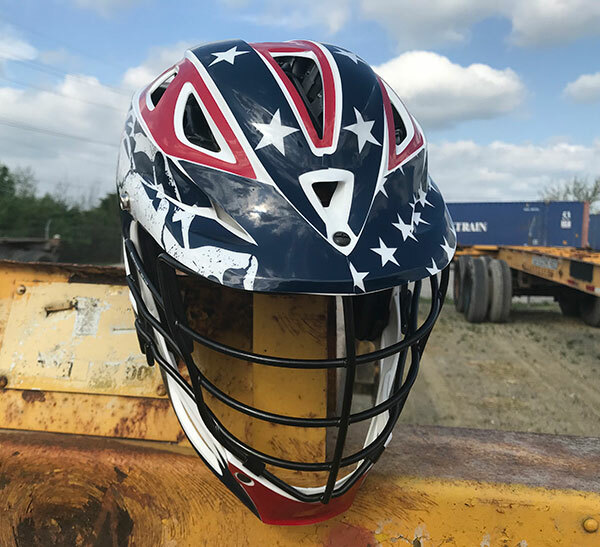 Stars were added to the top of the helmet wrap design tying the two halves together and the entire design was decked out in a red, white, and blue color scheme. The finishing touch was to incorporate “LOF”, the name of the organization into the design. This was added to the back-panel decal of the lacrosse helmet. The back panel is a perfect place for a team or mascot name. LOF wanted to make sure their name stood out. By adding metallic chrome color, the text draws a lot of attention. Overall, we were thrilled with the way the design turned out. The seamless transition from one side of the helmet to the other really makes it unique. The different elements will really show their competition overseas that they are proud of where they are from. We want to wish them the best of luck and safe travels as they head to Japan this summer! If you have a unique idea or want to show up your competition with a new look this year, we are happy to help. JackWraps® offers a full range of lacrosse helmet decals from traditional decal kits to full helmet wraps. We would be happy to discuss your project and get a free proof and quote together for your team. Reach out to one of our reps today to get the project started.